Good morning…sort of damp out there to start the day with some light showers moving through parts of the area…but overall it won’t be a bad day…as a matter of fact we could see temperatures pop this afternoon before some additional rains come into the region later today/tonight. From there though we turn a corner to spring as the new season starts tomorrow just before 5PM. Today: Variable clouds and potentially warmer with highs approaching 60° possible…maybe higher on the southside. Rain moves back in this evening. Wednesday: Not too bad of a day after some morning clouds…highs 55-60°…good start to Spring! Thursday: Pretty nice day overall with highs into the 50s again. and the HRRR model…showing forecast radar through tonight…a 2nd batch is likely sometime towards or after sunset. 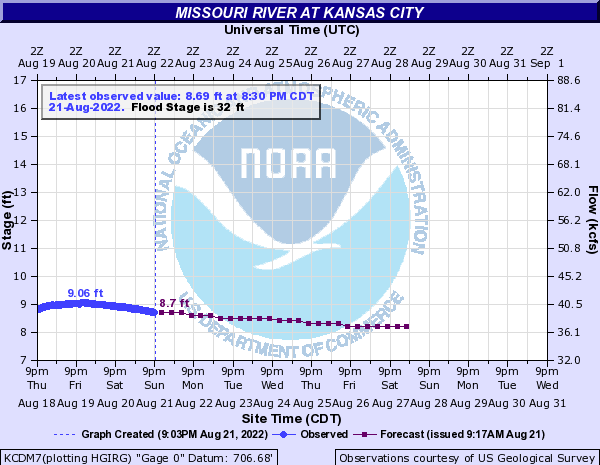 There may be a small bump in the MO River stage in Brownsville, NE (towards far NW MO) from that rain up there. No significant effects are expected though for the other gauges. I will be the 1st to tell you that I’m not a hydrology expert. The NWS has very capable people and very good model data that helps forecast specific river stages and heights that help in the planning of impacts from flooding. One of the issues that I banged hard on, over the weekend, that I felt wasn’t getting ANY play at all…was the fact that the MO River in the Downtown area was going to see minor effects from all this water coming down our way. If you remember I kept mentioning that the river heights in Downtown KC wouldn’t even be in the top 65 of crests of the river. I asked that question…why isn’t this a BIGGER deal for KC proper? The gauge itself is located across the river opposite the Downtown Airport. So with all the talk about the high to record breaking MO River crests in NW MO…why isn’t this a bigger deal downtown at least? Take a look at the river forecast…again for Downtown. Notice the river is expected to crest later this week…just BELOW minor flood stage. To get an idea of the importance of the stages…here is some additional information. We still have about a 3 foot cushion before we see some of the levees overtopped…and unless something unexpected happens…that won’t happen this week. So now you have an idea…some of the work down after 1993 on the River has helped the cause. Although I saw that in some cases in Nebraska that some of levee work down up there to contain potential flooding that was promised to hold back these waters were failures…it goes to an old adage I remember…water eventually goes to where it wants to. We try to hold back these large rivers…and often we can’t. Millions to billions of dollars have been spent since 1993 to improve the MO River flood prospects around KC proper. Anyway…now you know…and I know too! I’d also heard that, just as we saw, in 93, levees are failing, upstream from places like Omaha. Each time one does, the river now has a pretty large expanse to fill. That’s like having a tank almost full, being rapidly filled, and opening a valve, near the center, to another large tank. This, plus the fact that some levees were relocated, to give the river more of this expanse, seems to be preventing a replay of 1993. Also, I’d ask if the precipitation levels are as bad? Seemed like we were getting rain through Central Missouri, for a good bit of that year, then, it moved into Iowa and Nebraska. What about Watts Mill area?